Each year AESS holds an opening reception with keynote address. This year, the Association has the pleasure of hosting Dilafruz Williams who will be giving a talk titled Regenerative Hope: Gardens as Embodiments of Biocultural Diversity. Dilafruz Williams is Professor of Leadership for Sustainability Education in the department of Educational Leadership and Policy, at Portland State University, in Portland, Oregon. Among her three-decades-long partnerships with communities and schools, are the founding of: an environmental school, a master’s program in Leadership for Sustainability Education, and Learning Gardens Laboratory on a 12-acre property that functions as a research and education site serving teachers and their students many of whom are marginalized low-income, immigrants and/or refugees. Dr. Williams’ research has focused extensively on environmental education, place-based education, garden-based education, and service-learning. Her co-authored book Learning Gardens and Sustainability Education: Bringing Life to Schools and Schools to Life (Routledge, 2012) presents a practical model of student engagement. She was elected city-wide to the Portland School Board, 2003-2011. 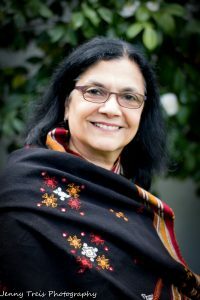 She has graduate degrees from Bombay, Syracuse, and Harvard Universities in the sciences, public administration, and education. Dilafruz’s passion for gardens is evident in her own delight of engagement with soil, plants, and wildlife in their multitude of manifestations of wonders and mystery that a garden offers. For her research, curriculum, instruction, and projects see ​https://sites.google.com/pdx.edu/dilafruz/ and http://learning-gardens.org/.